One of the key functions on the Biotechgate database is the ability to create alerts which are unique to your chosen criteria. This function will notify you of any significant profile updates/changes. 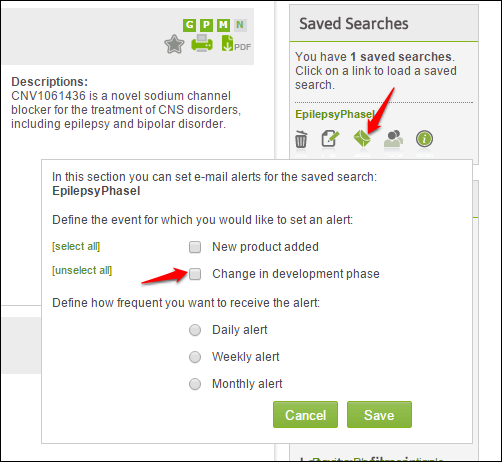 For example, say we’re interested in being alerted when a product related to epilepsy moves from Phase I development to Phase II. Carry out your search. Once you have your list of results simply click ‘save search’, enter a search title and then click save. 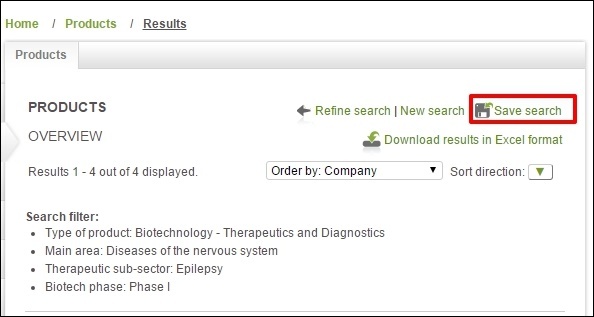 Now go to your ‘Saved Searches’ panel located on the right of the page and you will see an envelope icon. Click the envelope and it will give you an array of options depending on your search terms. In this instance, I can choose to be alerted if any of these products move into Phase II or if a new product is added in Phase I. Once you have made your selection, you can then choose the frequency that you receive the alerts. The Save Search feature ensures that the user does not miss any essential data and enables them to be much more productive with their time. Request a demo here to see the save search in action. If you do not have a Biotechgate account yet, please contact us to arrange a demo or a free trial.